Below are images of some of the samplers owned by the Oblate Sisters. We believe it is the largest collection of 19th century samplers worked by African American schoolgirls housed in one respository. The fact that the order kept these rare pieces illustrates how important sewing and needle skills were to the Oblate order for the entirety of their history. The needlework completed by Ann Roberts in 1829 is the earliest work found in the Oblate Sisters of Providence collection. While there is no documented proof that Roberts was a student or teacher at Saint Frances Academy, her needlework was kept by the Oblates for over 175 years. A sampler worked by Mary Pets, a student a Saint Frances School for Colored Girls, in 1831 when she was ten years old. Mary was a day scholar at the school form 1839 until 1832 and received a crown for excellent performance at the school award ceremony in August 1831. Mary Pets was a student at the Oblate School for Colored Girls in Baltimore, Maryland from 1830 until 1832. In August 1831 Mary received a "crown" for her excellent examination scores and overall scholastic performance. 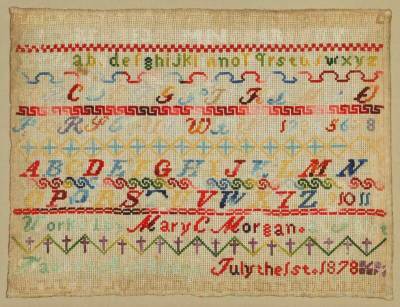 We believe that Mary worked on her sampler during the fall term and completed it in December 1831. The sampler is in the stylistic tradition of Baltimore building samplers worked by white middle and upper class girls attending several elite schools of the day. Such samplers are characterized by the tow story brick house with tow chimneys, mullioned windows and a paneled door with a transom over it. Mary change her composition by shifting the house to one side and filling the entire left side with a scene of a shepherd, shepherdess and a small flock of sheep, two large trees and birds. A large peacock in the center divides the sampler from the central motif. To our knowledge this is the first Maryland sampler completed by an African American schoolgirl to be reproduced in a chart pack or kit. The original sampler is held in the Oblate Sisters of Providence Archives in Baltimore, Maryland with other 19th century samplers worked by students of the Oblate Sisters of Providence. An intermediate level sampler enthusiast should enjoy finishing this sampler. The vast majority of the sampler is finished in cross stitch. Included in the kit are a stitching chart, stitch descriptions and diagrams, and suggested linen and thread colors. The chart pack was designed by Barbara Hutson of Queenstown Sampler Designs. The Mary Pets chart pack was selected by the With MY Needle and Pen Newsletter as one of two group projects for 2009. A sampler worked by Saint Frances School for Girls student Sarah Solomon in 1849. Sarah was enrolled at the Oblate School for one year as a boarding student. It is a depection of Saint John whose sainthood is symbolized by the halo, his red clothing (martyr), staff in the right hand, and lamb to the left. The caption at the bottom of the sampler reads "Harriet Cooper's Work at the Sisters School of Providence Baltimore Aug. 9, 1843." The sampler shows a first-phase skill in embroidery and is referred to as a marking sampler because provides practice in marking household linens such as tablecloths, napkins, bedding and clothing. It was worked by Mary Morgan (affectionately called Katie). Mary was from Saint Mary's County in southern Maryland and attended Saint Frances Academy from 1871 until 1878.